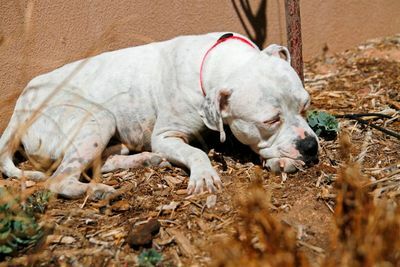 My friend Ann, who fosters dogs for the Santa Fe Humane Society, invited me over to check out her current charge: a deaf, allergy-beset, arthritic Pit Bull who isn’t great with other dogs. Wait ’til you meet her, Ann tells me. She’s perfect. In person, Ladybug’s face looks more Boxer than Pittie. That, and her crooked gait are the first things I notice as she wiggles toward the front door. 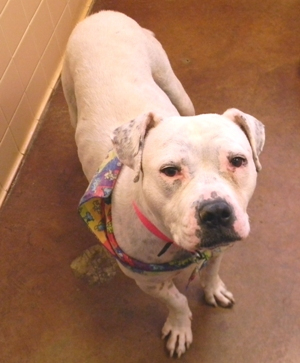 No one at the shelter knows her precise history, but a medical exam confirmed her body has seen way more trauma than has the average four-year-old dog. Typical. It’s the ones that have it so tough and remain so sweet that just wreck me. 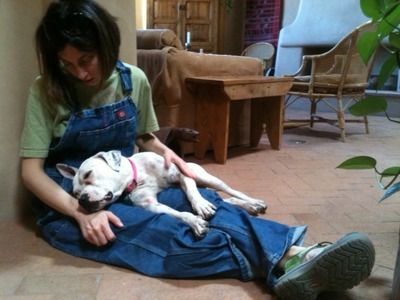 Ladybug manages to coax me to the floor and promptly squirms her skinny little self into my lap. Ann has a beautiful home with plenty of couch space, but we spend a good 20 minutes there on the cold brick floor of the foyer. I was pinned, and Ann hunkered down beside me in solidarity. Ladybug hardly moved. It might’ve been the most uncomfortable 20 minutes I never wanted to end. Yeah, she’s pretty much perfect, I think out loud. Incredibly low maintenance for a dog with so many issues on paper. Ok, so she’s hard of hearing, but so are many companion animals (almost all, if they live long enough). And she has allergies, but all that means is feeding a grain-free dog food. Maybe her arthritis will require more medical attention at some point, but for now, she gets around just fine. Well, and she’s housetrained and perfectly behaved indoors, Ann says. She’ll take as much cuddling as you can dish out, but she’s not clingy. Grateful for whatever attention she gets and doesn’t ask for more. I just want to sit here with her in my lap forever, I say. Ann smiles. How hard could it be to find someone who feels the same way? 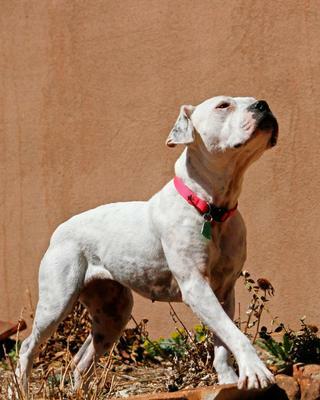 Ladybug is currently in foster care in northern New Mexico. Interested in adopting? Email [email protected] for more info.